GN Solids Control mud tank system is widely used in many countries and areas. Some oil drilling contractor may buy one complete mud tank system with 3 to 7 mud tanks; some third party service company may buy one or tank mud tank system professional for intermediary use. Recently of 2014, we sell one mud tank system with single mud tank & 2 mud agitators & 2 mud guns to Middle East, the customer is locally strong oil service group company with solids control service branch & drilling waste management service branch. They have CD518 High Speed centrifuge, 414 low speed centrifuge (used for barite recovery system), Shale shakers, Minimum shear mixing tanks, Oil separation equipment, Oil separation equipment etc. Early of 2014, the customer buys 3 Hi-G dryer shakers from GN Solids Control. They use the Hi-G dryer shaker for water based mud drilling cuttings treatment. The Hi-G dryer shaker with four panel shaker screen which is replacement for Swaco Mongoose shaker. They customer can buy enough shaker screen from us in stock for their projects; or they can source it locally for urgent use. After the Hi-G dryer shaker purchase order, the customer issue one more order for single mud tank system. The mud tank is shipped by bulk vessel with longer shipping time and higher freight cost. In spite of these disadvantages, impressed with GN Solids Control Hi-G dryer shaker quality, the customer insists on buying the mud tank system from us directly. The mud tank system is including one mud tank with necessary accessories, 2 mud agitators with double impellers & 2 mud guns for tank cleaning. The customer is also considering buying decanter centrifuge from us and matching the flocculent units. This dewatering unit is also used for treat the water based mud drilling cuttings. 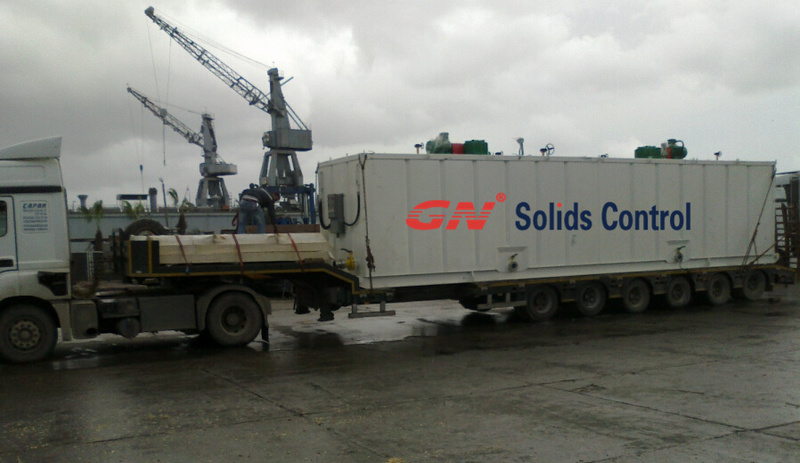 GN Solids Control as leading company for solids control & drilling waste management equipment. 2015 SEE GN Solids Control in CIPPE.